Kylie Jenner’s daughter was born one year ago. Happy Birthday, baby Stormi! Kylie Jenner and Travis Scott’s daughter turns one on February 1, and her parents are celebrating in a major way. Click through the gallery to see the 12 cutest moments from her first twelve months! On March 1, Kylie, 21, shared the first photo of herself with her baby girl. Little Stormi was all bundled up, but fans still freaked out over how cute she was. Two days later, daddy Travis, 26, shared Stormi’s first fire selfie. “Our little rager !!! !” he captioned the photo. In August, she celebrated her dad’s VMA performance on an NYC rooftop with her parents. At the same time, she was embroiled in her first rap beef with Nicki Minaj, who accused Travis of using his baby to sell albums. On September 14, aunt Kim Kardashian posted a photo of Stormi with cousins Chicago and True. She captioned it, “💕 The Triplets 💕,” giving fans a nickname for the trio, who were all born within three months of each other. In October, Stormi made her first trip to a pumpkin patch. Some of the pumpkins were bigger than she was! Stormi’s first Halloween was, naturally, over the top. First, she and her mom dressed up as matching butterflies. It called back to Twitter speculation last year that Kylie was naming her baby Mariposa — Spanish for butterfly. Then, she dressed up as her literal namesake — a storm! 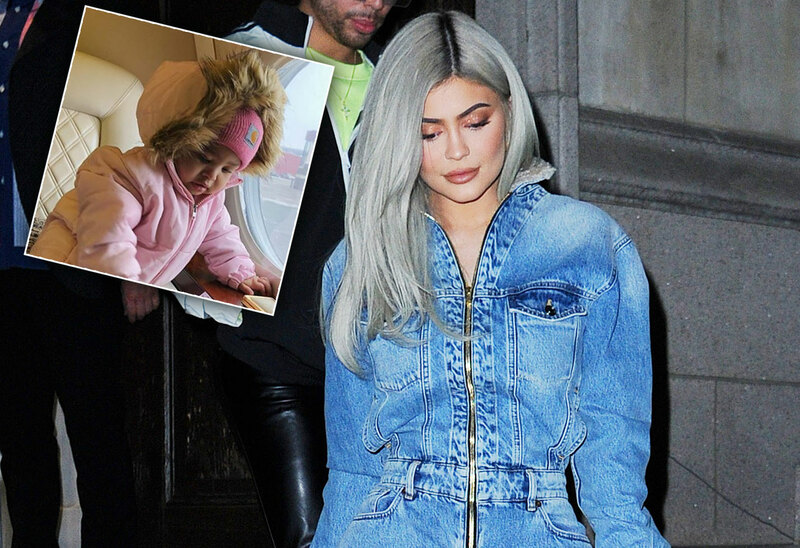 On November 18, fans went gaga over a video of Kylie trying to teach the baby to say “Kylie Cosmetics.” She made lots of noises and even said, “Dada,” but her mom’s company evaded her. Later that month, Travis brought Stormi with him on his Astroworld tour. The baby danced backstage while watching her dad perform. In December, Stormi hit the slopes for the first time in a full body snowsuit. For Christmas, Kim got Stormi and all her female cousins some very chic little Louis Vuitton bags. When the baby picked hers up, she flipped it over her shoulder like a natural. Earlier this month, Stormi had a beach getaway with Kylie, Travis, and mom’s BFF Jordyn Woods. Kylie shared a too cute video of the little one getting her toes wet in the sand and laughing up a storm. What’s your favorite moment from Stormi’s first year? Sound off in the comments!